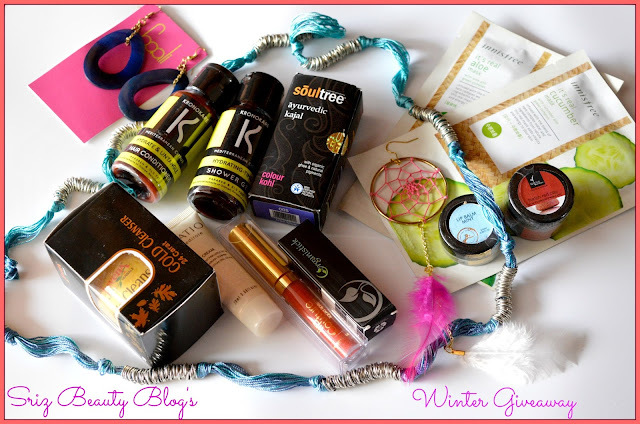 Sriz Beauty Blog: Winter Giveaway - Closed!!! Its been a long time since I have conducted a giveaway and so I thought of conducting one asap!!! I love subscription boxes and I do subscribe to many subscription boxes and I receive loads and loads of products every month.Some times I get the same products again and again,which I am not able to use as I love to try new products each time.Recently while I was searching for some particular product,I realized that I have lot of wonderful products lying in the corner!So, I thought of giving these wonderful products to my lovely readers.So,that at least you can make good use of it.As the winter season is approaching, so,I selected the products accordingly!!! All these products are brand new and I have opened one or two to just take photographs. There will be only one winner for this giveaway,who wins all these 14 products!!! b)The giveaway is open till December 10th and winners will be announced with in 1 week after the contest ends. 2) Follow me on Twitter. You can do it by clicking here. 3) Follow me on Google+.You can do it by clicking here. 5) Subscribe for the Email Updates from Sriz Beauty Blog.For this you need to enter your email address into the box in the right top corner of the blog and activate the link which is sent to your corresponding email address. Once you are done with all the steps,comment below that you have entered the giveaway. Winner will be picked randomly and We will ship the prize to the winner.